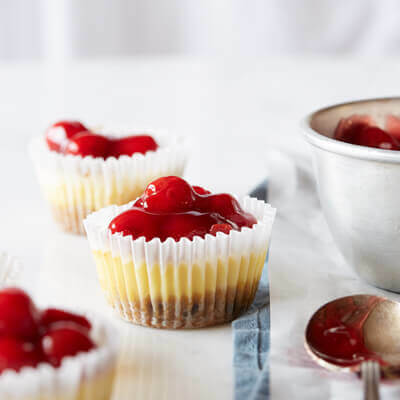 Using refrigerated chocolate chip cookies dough as a base, these portable cheesecake cookies cups are the perfect dessert when entertaining! PREHEAT oven to 325° F. Paper-line 24 muffin cups. Place one piece of cookie dough in each muffin cup. BEAT cream cheese, sweetened condensed milk, eggs and vanilla extract in medium bowl until smooth. Pour about 3 tablespoons cream cheese mixture over each cookie in cup. BAKE for additional 15 to 18 minutes or until set. Cool completely in pan on wire rack. Top each with level tablespoon of pie filling. Refrigerate for 1 hour.